As the popularity of Country music continues to grow there are fewer and fewer flag bearers for traditional Country. Instead its quickly becoming a market saturated with Pop come Country music, there are a few acts still continuing to impress though with a very traditional sound. One such band are Midland who are currently impressing audiences across the country right now. Opening tonight’s feast of Country music though is Desure, whose heartfelt Country ballads provide the perfect opening to the evening. His relaxed set goes down well with this packed audience, but this crowd appear to be rather excitable and require something slightly more enthusiastic. Fortunately, Midland are here to supply that in their own inimitable style as a rousing chorus of Take Me Home, Country Roads rings out before the band have even taken to the stage. They open with Check Cashin’ Country and quickly hit their stride with a string of tracks from their lauded debut album On The Rocks. Quickly followed by the likes of Burn Out, Electric Rodeo and Out Of Sight, instead of mosh pits tonight’s venue is packed with groups of people line dancing to these upbeat Country tracks. Even new tracks like 21st Century Honky Tonk American Band are suitably impressive. The trio certainly know how to whip up this crowd as they all hang off the bands every word, a string of covers sustains this impressive set too. With The Rolling Stones Miss You, and The Allman Brothers Midnight Rider being particular favourites. After all this though the band return to their own tracks to close out this energetic set only to leave this crowd screaming for more after the brilliant Miss You has ended. Midland were only too happy oblige though with a huge singalong to Drinkin’ Problem, followed by three more wonderful covers including Willy Nelson’s I Can Get Off On You and Chris Isaak’s Wicked Game. Tonight Midland truly set Newcastle alight with this enthusiastic set, the trio are in fine form and fine voice despite claiming to be hungover. They leave every member of this crowd truly in awe of their traditional country sound! 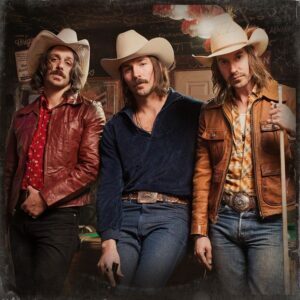 ~Midland can be found online here midlandofficial.com. They’re also on Facebook and tweet as @MidlandOfficial.